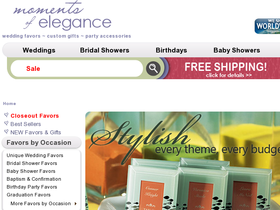 Shop Moments of Elegance online at MomentsOfElegance.com for all your wedding, shower and special event needs. Moments of Elegance carries a huge selection of party favors for your special day. Whether you are looking to save money on your party favors or looking for a unique way to say thank you to your wedding party, Moments of Elegance can help you add a little color and elegance to your big day. Save on your next purchase from MomentsOfElegance.com with MomentsOfElegance.com discounts, MomentsOfElegance.com coupons and MomentsOfElegance.com savings from 58coupons.com. Take 10% off any order over $99 from MomentsofElegance.com using this coupon code. Click link. Get on over to Moments of Elegance to receive free shipping on orders over $149 with this coupon code. Enjoy $5 off orders of $75 or more using this coupon code from Moments of Elegance. Click link now. Check out the deal of the month to save 10% or more from MomentsOfElegance.com. Be sure to check often as it changes. Click link to view. Moments of Elegance is offering its beautifully colored organza bags for as low as $0.24. Click link to see the various colors. Hurry on over to Moments of Elegance to save up to 80% on closeout items before they are all gone. Click link to view.